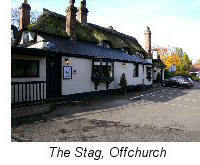 Within short driving distance from Leamington Spa this easy circular walk starts from The Stag Pub in the lovely village of Offchurch, Warwickshire. 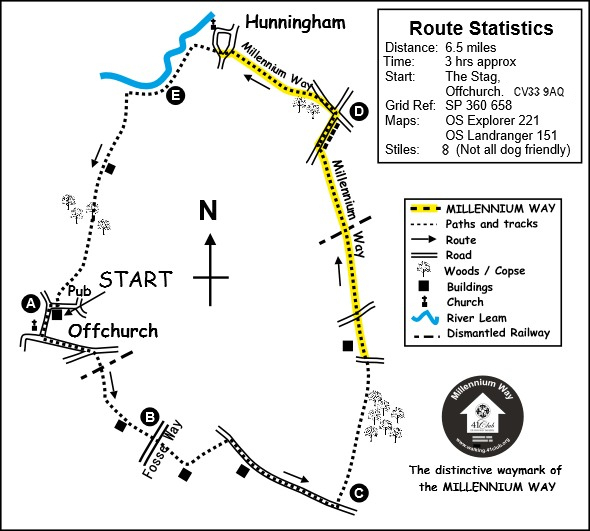 For part of the walk, you will enjoy the delights of The Millennium Way before turning south to follow a section of the River Leam on your return to Offchurch. The walk is just over 6 miles. We start our walk from the Stag pub in Offchurch. (There is a notice in the car park requesting walkers to park in the overflow car park). With your back to the pub go left on road out of the car park for 30 paces to turn left up School Hill (signposted Leamington). Continue past Offchurch Village Hall to the T-junction where we turn left. 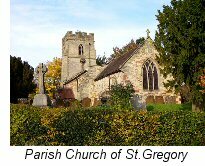 (On the right at the T-junction you will find the parish church of St. Gregory which may be of interest to visit). Offchurch may have been home to Offa, who was the King of Mercia from 757 to 796. A church was built in the village, hence the name Offchurch (Offa's Church) but the original has long since gone and the current church has been rebuilt on the supposed site of Offa's church. It is thought that King Offa's son was killed nearby and the original church was built to commemorate his son's death. Having turned left at the T junction go along road past Village Farm on your right to another T junction. 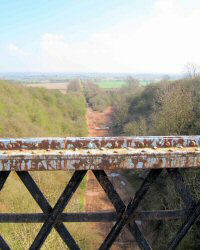 Go directly across road to take waymarked footpath ahead to then cross a bridge over a disused railway line. Emerging from the bridge walk directly forward aiming for the hedge corner approx 250 metres ahead. On reaching hedge corner go left around field keeping hedge left, then just before double metal gate take waymarked path on left through hedge gap. Continue ahead keeping hedge right past large metal gate right to exit field through corner hedge gap. Keep ahead with wire fence to your right passing dwellings, and continue straight ahead across the field, keeping approx 30m to left of surfaced access lane which is a private drive to Fosse Way Barnes, and take the hedge gap to main Road (Fosse Way). Cross over the road to find hidden stile in hedge gap on opposite side of road, next to a telegraph pole. Take stile and continue directly ahead keeping hedge left to reach a gap in the far left corner of field. Go ahead through gap then past outbuildings to house right, emerging onto surfaced lane which you cross entering into a field where you immediately turn left. Keping hedge on left and recently planted trees on right follow the field round, eventually bending to the right, passing a metal gate in the corner and exit the field some 100 metres further on, through the waymarked hole in the hedge, to reach the road. Turn right on road continuing gently downhill along the wide grass verge for just over half a mile to find a wide unnamed track left, but known as Ridgeway Lane (this is an unclassified county road). Turn left along the lovely tree lined track for about 3/4 mile until you reach a road. Cross road and go through gate. You are now on The Millennium Way and will see the distinctive black waymarker on the post. Continue ahead up field to exit by wide gap to go on track and lane to main road. Cross road and continue along tree lined lane passing Snowford House left, then ahead on vehicle track ( which may occasionally be muddy and rutted in parts) eventually to cross unique and interesting high bridge over disused railway line and coming to tarmac drive leading to road. Go right on road to reach cross roads, then turn left on main road and after some 100 metres look for stile in hedge on left (next to telegraph pole). Cross stile and go half right across field to corner, then 50m to right along hedgerow to take bridge / stile located towards the middle of the hedge. (Note. There is a single wire here obstructing your path which you need to negotiate to reach the bridge/stile so take extra care as you cross). Go ahead to find hedge gap. Through gap to continue with hedge right to cross next stile into large field. Go directly ahead, across large field to reach far hedge then go left with hedge right for some 30m to find and take hedge gap to road. Go left on road some 10 metres and take road right. After 10 metres take waymarked path left into large field. (Here we are leaving The Millennium Way). Keep along edge of field with hedge and fence right, continuing past large metal gate towards corner of field to find kissing gate. Take kissing gate and go left along hedge towards kissing gate ahead on your left. Take kissing gate and continue directly ahead across next field keeping hedge left to reach wide gap in top left corner. ( At this point you will notice the River Leam on your right). Go through gap and over small stream (sometimes dry) to continue gently up the next field to take far left corner kissing gate. 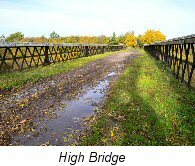 Continue directly ahead with hedge and river right and after a short distance you will reach a waymarker where the paths diverge. Take the left fork heading half left across the field towards corner gap. Once through gap go ahead slightly right to take second gap then go left along edge of large field keeping hedge left. As you approach the farm buildings ahead another footpath ( surfaced ) joins from the right. Veer slightly right here to stay along edge of field keeping the farm buildings on your left. Go through gap with metal gate and continue ahead towards trees keeping wire fence on your left. Go through corner metal gate into small wooded area. Emerging from woodland via metal kissing gate, keep ahead in field with hedge right. Exit field via corner stile, Taking further stile into small field and go forward into farmyard by stile or metal gate. Go through next gate to cross track and take the next stile ahead. Continue directly ahead across field keeping telegraph poles to your left and exit by kissing gate to road which brings you back to your starting point for some well earned refreshment. Leaving the Stag, the church of St. Gregory is passed, followed by crossing of the trackbed of the old Leamington-Rugby line, built in 1851 and closed in the mid-1960’s. The Fosse Way, the roman road from Exeter to Lincoln, via Bath and Leicester is next crossed. The next short road section is the Welsh (Salt) Road, dating from at least the Roman occupation, which links Droitwich to Northampton and was used to carry salt for meat preservation and general trading. The name Hunningham comes from ancient times meaning 'Homestead / village of Huna's people' or 'hemmed-in land of Huna's people'. The church of St Margaret with its picturesque timber bell cote dates from 13th C. There was already a church at Wappenbury but parishioners on the Hunningham side of the river were often prevented from attending services due to flooding so Sir Geoffrey Corbucion who died in 1242 built St Margaret’s. To the north of the church are the holloways of an abandoned part of the village. The village population shrank in the mid-1800’s due to closure of the local lunatic asylum. 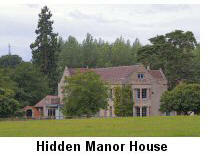 There is a nature reserve close to the village, managed as a hay meadow, called Hunningham Meadow. The return route from Hunningham follows the River Leam for a short distance before returning to Offchurch. The Offchurch Estate was purchased in 1936 by Harry Johnson, a textile manufacturer from Coventry and Macclesfield, whose descendants today retain much of the estate and live at Offchurch Bury in the manor house, originally a 16th and 19th century building but reduced in size by 75% in 1954. The house is not open to the public.